If you want to learn computer programming languages, then you’ll always asked a question of which are the best programming languages to learn first? This question force me to guide you all of those who asking yourself or others. Basically it depends on what you want to optimize.Because there are hundreds of programming languages exists today. Means every programming languages have it’s own benefits and drawbacks. Some languages are powerful but complex and some are easy to learn but only use for basic operations. Remember that, the any technology or language you learn are not the important bit when it comes to becoming a professional programmer. When you’re trying to become a programmer, then motivations from others, frustration tolerance, social support and access to expertise everything important for you in your life. Always care about your future life and career choices. I’m a student of computer science, so I always working with programming. I analyzing different languages and try to learn all of them but not succeeded. Programming only for those who are passionate about it, if you just want to try learn programming, without any passion or hobby, you can’t be get good in this. Many people said that, programming is very tough field, but I always said that it is very easy. If you’re not interesting it then it becomes tough for you, but if you’ve passion and choose programming as a career then it comes to be very easy field. When you’re just beginning, you might not know about these languages,but when you grew up, and learn any one and then other, you might be get interest in this field. I’ve mention 15 best programming languages which are excellent and popular and mostly used in the world. All these are the professional programmer choice so you love this list. 3 What is Programming Language? A language is a way / service / ability to communicate with others. It acquires and use the complex systems for communication. The scientific study of the language is known as Linguistics. If you two person want to communicate with each other, they use language and talk to each other. Same like in computer system, when user want to communicate with computer system, they use any one language which is called computer language. Programming is the ability to solve problems in an easy way. It involves different activities like analysis, understanding, sharing thoughts etc. In computer programming, we write some code which is known as Source Code. In this code, we telling the computer what to do and how to do. This ability is called computer programming. A programming language is a computer language that is use to communicate with the computers. We write some instructions in any programming language for a computer to tell them what to do and how to do? We create programs using any programming language to control the computer machine behavior. Any programs contains two basic part, semantics (Meaning) and syntax (form). There are hundreds of languages are developed and programmers working on it to developing more and more that’re easy to understand. This is the list of 15 best programming languages that are mostly used by professional best programmers. You can check this list for further detail about these languages read the full article. 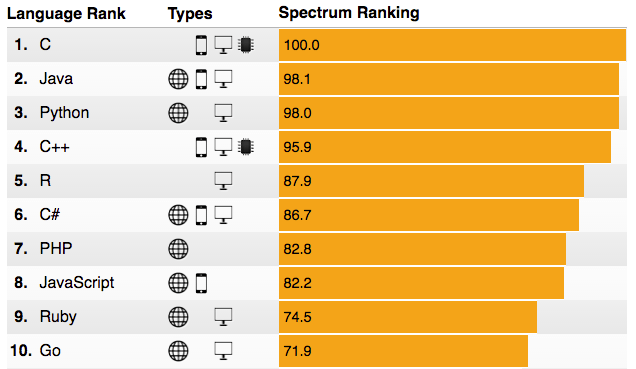 According to IEEE spectrum ranking, the top 10 programming languages ranking which is set by default intended to echo the interests of the average IEEE member. So below is the chart in which you can clearly find out which is the most used and popular language. Without any doubt, TIOBE is the popular and powerful software quality company. They display the average ranking of each and every ranking and updates their charts on regular basis. Now first check the chart below of 15 Top programming languages. 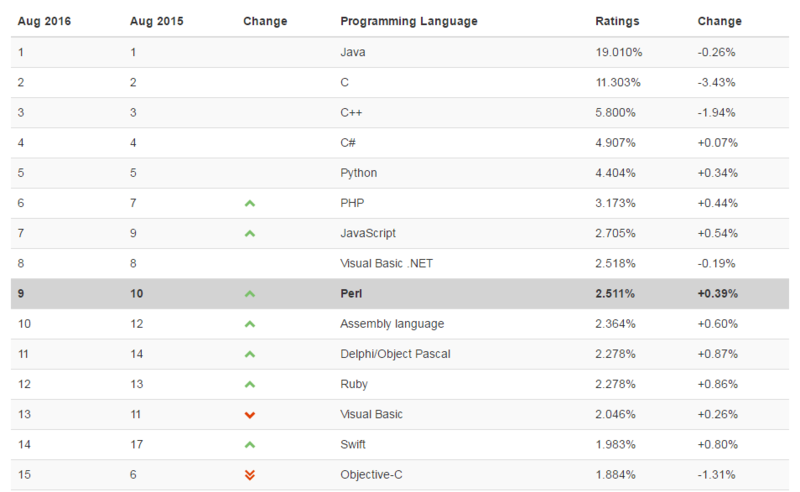 In this chart you can clearly see that, JAVA is the world No.1 language and it becomes the programmers choice. I always interested in coding with C / C++, and Java also very similar, just syntax changed. Almost all programming languages are same just their syntax different somehow, but overall all the languages are same and you can easily learn any one language, and all others are automatically memorize you. So after watching this chart, you can categories all these languages and easily understand which is the best language in the world. These chart updated everyday, and this data is based on programmers working choice. 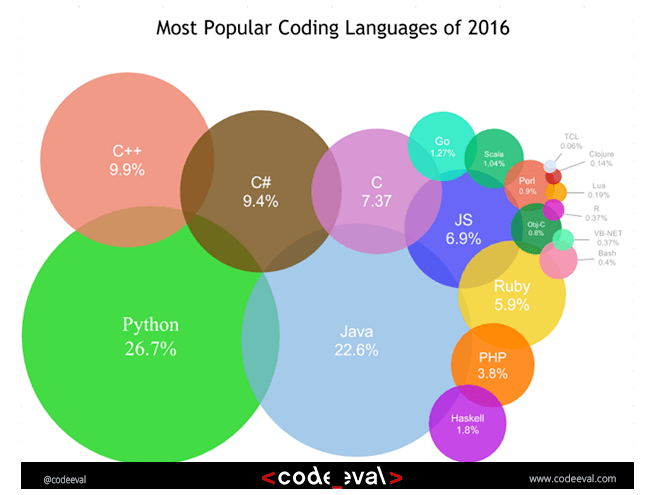 Almost all the famous and popular programmers in the world choose Java is the best language for development, then C and C++ may used. This chart gives you some idea of which is famous and which is non-famous. But I recommended you to choose first C language, because their syntax is so simple and easy to learn and understand, and if you learn properly C language, then C++ automatically you learn. C++ is developed from C language just some syntax is different, but overall both are same.But choice is your, you can choose any one and try to learn programming and enter to the world of computer. So if you want to become a developer, then basic different between great and good developer is just Curiosity. Good developer writing a codes in different formats ,but great developer doesn’t look the code, first they look the problem and understand them completely, then try to coding for this problem solution. Great developer always want to understand how things are work and how to completing their tasks in the quickest and easiest possible time. So this the list of “15 Best Programming Languages All the Time” which you like then share with others. If you’ve any knowledge and data about these languages then share with us via comment below and we update this article according to your suggestions.